Reference number for this case: 9-oct-54-Carcassonne. Thank you for including this reference number in any correspondence with me regarding this case. Riding a bike towards Rânes (Orne) Mr. C. Couette, son of a plumber from Tesse-la-Madeleine, was overtaken by a strange luminous craft which, at high speed, shaved the treetops. The craft, about 4 feet in diameter, had the shape of a ball of fire domed on top. It was observed for ten seconds. At 17 km from Angouleme, about thirty people Tourriers saw on the night of the 8th to the 9th, a "kind of cigar" that stood motionless at forty meters above the national road No. 10 for a twenty minutes. The machine, which was provided with two fins, then departed at a speed of about 250 to 300 kilometers an hour. A motorist of Calais saw over the road to Boulogne-sur-Mer, an unidentified craft he believes to be a flying saucer. Featuring clearly visible dome on the top, the machine moved noiselessly. It flew over the road, veered and sped towards Calais. I saw it disappear and, at that time, the bluish glow gave way to a white light as it had initially appeared to me." Sunday night, while he was driving his car, Jean Bertrand, a mechanic at Carcassonne, saw, flying low, a bright spherical craft of metal whose upper part seemed to be made of plastic. He could, he said, easily distinguish two human forms in this craft that disappeared at high speed in the direction of the East. A "flying cigar" was seen by the rural mail carrier in a village near Huy, between Namur and Liege. The postman said the craft was high in the sky when he came close, but he could clearly distinguish two figures on board of "approximately human" shape. It is reported in Alexandria, from official sources, that a mysterious craft stayed in the air above the control tower of the Muzha airport for an hour Saturday night. The machine, in the shape of lengthened "saucer", changed color from red to orange and from green to gray, before moving away at breathtaking speed. Aimé Michel notes that an observation occurred on October 9, 1954, in Carcassonne in the Aude. He indicates the newspaper Le Parisien Libéré of October 11 as source. La Charente Libre (edition of Angouleme), October 12, 1954: About four o'clock in the afternoon M. Jean Bertrand, a mechanic of Carcasonne, saw a spherical object flying at low altitude. Its lower part seemed to be made of shining metal and the upper part of plastic. He said that he could see two human forms inside the machine before it disappeared at high speed toward the east. The authors indicate that on October 9, 1954 Jean Bertrand was driving on a road near Carcassonne, the Aude, France, and he came upon a metallic sphere posed on the road ahead of him. He reported that the top half seemed to be transparent material of some kind, and that he saw two human shaped figures standing inside. As he approached, the object took off at high speed. Oct. 09, 1954, 04:OO P.M. Carcassonne (France). As he was driving near Carcassonne, Jean Bertrand saw a bright, metallic sphere on the road ahead. The top half seemed to be made of transparent plastic, and two humanlike figures were standing inside. It took off rapidly, flying east. (Paris-Presse, 12 oct. 1954) (48; M 145). The author indicates that on October 9, 1954, while he was driving in the Carcassonne area in the Aude, Jean Bertrand saw on the road in front of him a brilliant metal sphere of which the higher half seemed made of transparent plastic since he easily distinguished two forms of human appearance upright inside. The object flew away quickly towards the east. The two authors, journalists and ufologists, indicate that on October 9, 1954, around 4 p.m., a mechanic of Carcassonne, Jean Bertrand, returned from Castelnaudary, and when he arrived at 10 kilometers of Carcassonne, he saw a brilliant metal sphere in front of him on the road. The higher half of the sphere appeared to him to be made of a transparent plastic, through which he distinguished two silhouettes of human appearance. The machine rose quickly to the direction of the east. Garreau and Lavier indicate that the sighting occurred 10 kilometers west of Carcassonne. The two authors indicate that on October 9, 1954 to 16:00, in the Aude, a person returning from Castelnaudary and who was within ten kilometers of Carcassonne, that is to say doubtless on the commune of Pezens, saw a shining metallic sphere on the road. In the higher half, which seems made out of transparent plastic, he saw two silhouettes of human appearance, standing inside. The machine rose quickly and took the direction of the east. La Charente Libre (edition of Angouleme), October 12, 1954: About four o'clock in the afternoon M. Jean Bertrand, a mechanic of Carcassonne, saw a spherical object flying at low altitude. Its lower part seemed to be made of shining metal and the upper part of plastic. He said that he could see two human forms inside the machine before it disappeared at high speed toward the east. Four o'clock in the afternoon on the 9th a large ball-like object sat on the shoulder of the road that ran passed the town of Carcassonne. The bottom half of this object seemed to be made of metal, while the upper portion was transparent. As M. Jean Bertrand approached the sphere in his car, he could see two beings of a humanoid shape inside the UFO which rose and then sped eastward. 88. 88. Paris, France. Paris-Presse. 12 October 54. The author indicates that on October 9, 1954, according to Figuet pages 136 and 137, on the road from Castelnaudary to Carcassonne in the Aude, within 10 kilometers of Castelnaudary, Jean Bertrand saw a metal sphere on the road, having a translucent higher part allowing to distinguish two silhouettes of apparent human beings who stood inside. Then the object took off fast and went in the direction of the east. Jean Sider notes that the observation seems to have taken place 2 km before Penautiers but that Figuet does not bring precise details on this matter. The Belgian ufologist indicates that on October 9, 1954, in France in Carcassonne, Jean Bertrand saw at 04:00 p.m. while driving in the car, a brilliant metal sphere on the road in front of him. The higher half seemed made of a transparent plastic. Two silhouettes of human appearance were upright inside. The machine rose quickly and took the direction of the east. The source is indicated as Jacques Vallée in "Chronique des apparitions ET", Denoel, J'ai Lu collection, 1972, page 273. Jim Hickman indicates that on October 9, 1954, in France, as he was driving near Carcassonne, Jean Bertrand saw a bright, metallic sphere on the road ahead. The top half seemed to be made of transparent plastic, and two humanlike figures were standing inside. It took off rapidly, flying east. As he was driving near Carcassonne, Jean Bertrand saw a bright, metallic sphere on the road ahead. The top half seemed to be made of transparent plastic, and two humanlike figures were standing inside. It took off rapidly, flying east. James Neff indicates that on October 9, 1954, in Carcassonne, France, Jean Bertrand was driving when he spotted a spherical object sitting on the road in front of him. Through a translucent top, he could see a human-shaped shadow moving. As he approached, the object took off. The website lists that on October 9, 1954 in Carcassonne, France, Bertrand was driving when he saw a spherical object on the road in front of him. Through a translucent top, he could see a human-shaped shadow moving. The source is indicated as "CE-3-101 Randle/Estes, FOV pg267". Donald Johnson reported that on October 9, 1954, driving near Carcassonne, France at around 4 p.m., Jean Bertrand saw a bright, metallic sphere ahead on the road. The top half appeared to be made of transparent plastic, and two humanlike figures were seen standing inside. It took off quickly, flying away to the east. The sources are given as Aime Michel, Flying Saucers and the Straight Line Mystery, p. 145; Jacques Vallee, Passport to Magonia, pp. 221-222. Driving near Carcassonne, Jean Bertrand saw a bright metallic sphere on the road ahead. The top half seemed to be made of transparent plastic, and 2 human like figures were standing inside. It took off rapidly, flying east. The witness, a mechanic, watched a spherical object flying at a low altitude over the area, its lower part appeared to be made out of a shiny metal and the top half transparent plastic. Two human like figures could be seen standing inside the object, which disappeared at very high speed. Luc Chastan indicates that in the Aude in Carcassonne on October 9, 1954 at 16:00 hours, a witness returns from Castelnaudary. Ten kilometers from Carcassonne, doubtless on the community of Pezens, he sees on the road a brilliant metal sphere. In the higher half, which seems made out of transparent plastic, he sees two silhouettes of human appearance, upright inside. The craft rises quickly and takes the direction of the east. Luc Chastan indicates that the source is "Ovni, Premier dossier complet... by Figuet M./ Ruchon J.L. ** Alain Lefeuvre pub. 1979." The website indicates that on 9 October 1954 at 16:00 in Carcassonne, France, a bright, metallic sphere was seen on the road. Two humanlike figures were standing inside. As he was driving near Carcassonne, Jean Bertrand saw a bright, metallic sphere on the road ahead. The top half seemed to be made of transparent plastic, and two humanlike figures were standing inside. It took off rapidly, flying east. The website comments that "An object was observed. Occupants of the craft were seen. One metallic ball was observed by one experienced male witness on a road for over three minutes. Two dwarves were seen." The website then adds that "Driving near Carcassonne, Jean Bertrand saw a bright metallic sphere on the road ahead. The top half seemed to be made of transparent plastic, and 2 human like figures were standing inside. It took off rapidly, flying east." The sources are indicated as Webb, David, HUMCAT: Catalogue of Humanoid Reports; Guieu, Jimmy, Flying Saucers Come from Another World, Citadel, New York, 1956; Michel, Aime, Flying Saucers and the Straight-Line Mystery, S. G. Phillips, New York, 1958; Lorenzen, Coral E., Flying Saucer Occupants, Signet T3205, New York, 1967; Bowen, Charles, The Humanoids: FSR Special Edition No. 1, FSR, London, 1966; Lorenzen, Coral E., Encounters with UFO Occupants, Berkley Medallion, New York, 1976, ISBN:425-03093-8; Bowen, Charles, The Humanoids: FSR Special Edition No. 1, FSR, London, 1966; Pereira, Jader U., Les Extra-Terrestres, Phenomenes Spatiaux, Paris, 1974; Vallee, Jacques, Computerized Catalog (N = 3073); Vallee, Jacques, Challenge to Science: The UFO Enigma, Henry Regnery, Chicago, 1966; Vallee, Jacques, Preliminary Catalog (N = 500), (in JVallee01); Vallee, Jacques, A Century of Landings (N = 923), (in JVallee04), Chicago, 1969; Schoenherr, Luis, Computerized Catalog (N = 3173); Delaire, J. Bernard, UFO Register Volume 7 (1976), Data Research, Oxford, 1976; Hatch, Larry, *U* computer database, Author, Redwood City, 2002; Rosales, Albert, Humanoid Sighting Reports Database. The website indicates that on 12 October 1954 at 16:00 in Carcassonne, France, the witness, a mechanic, watched a spherical object flying at a low altitude over the area, its lower part appeared to be made out of a shiny metal and the top half transparent plastic. Two human like figures could be seen standing inside the object, which disappeared at very high speed. The source is indicated by a link to a nonexistent web page. As he was driving near Carcassonne, mechanic Jean Bertrand saw a bright metallic sphere flying low over the road ahead. Its lower part appeared to be made of shiny metal and its upper part of transparent plastic, though which he could see two humanoid forms standing inside. It took off rapidly towards the east. Vallee Case 219, citing Paris-Presse 12 October 1954. Jean Luc Rivera in MUFON UFO Journal 130, p.16 citing La Charente Libre 12 October 1954. The author indicates that there was a close encounter of the 3rd kind 10 km in the west of Carcassonne, in the Aude, October 9, 1954, at 04:00 p.m..
Mr. Jean Bertrand, mechanic, coming back from Castelnaudary, at ten kilometers of Carcassonne, saw on the road a brilliant metal sphere. In the higher half, which seemed made out of transparent plastic, he saw two silhouettes of human appearance upright inside. The sources are indicated as C. Garreau and R. Lavier, "Face aux Extra-Terrestres", page 187; Jimmy Guieu, "Black-Out sur les Soucoupes Volantes", page 203; Michel Figuet and Jean-Louis Ruchon, "OVNI, le premier dossier complet des rencontres rapprochées en France", pages 136-137; Jean Sider, "Le dossier 1954 et l'imposture rationaliste", page 190. *Oct. 9, 1954 - As he was driving near Carcassonne, France at around 4:00 o'clock in the afternoon, Jean Bertrand saw a bright, metallic sphere ahead on the road. The top half appeared to be made of transparent plastic, and two humanlike figures were seen standing inside. It took off quickly, flying away to the east. (Sources: Aime Michel, Flying Saucers and the Straight Line Mystery, p. 145; Jacques Vallee, Passport to Magonia: A Century of Landings, pp. 221-222, case # 219). The witness, a mechanic, watched a spherical object flying at a low altitude over the area; its lower part appeared to be made out of a shiny metal and the top half transparent plastic. Two human like figures could be seen standing inside the object, which disappeared at very high speed. The observation suggests a helicopter as the likely cause. Not looked for yet. Probable helicopter. 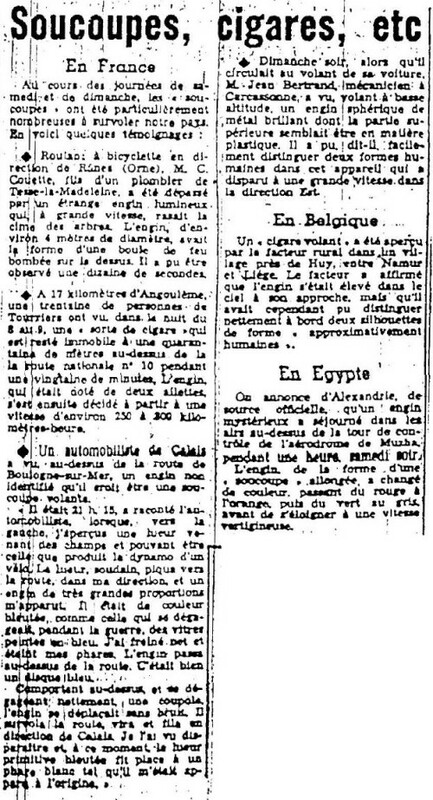 [---] Article in the national newspaper Le Parisien Libéré, Paris, France, October 11, 1954. [cr1] Article in the national newspaper La Croix, France, October 12, 1954. [---] Article in the regional newspaper La Charente Libre, edition of Angoulême, France, October 12, 1954. [---] Article in the national newspaper Paris-Presse, Paris, France, October 12, 1954. [am1] "Flying Saucers and the Straight Line Mystery", book by Aimé Michel, English translation of "Mystérieux Objets Célestes", S. G. Phillips Incorporated publishers, USA, page 145, 1958. [lo1] "Flying Saucer Occupants", book by Coral and Jim Lorenzen, Signet Books publishers, USA, page 94, 1967. [jv1] "Un Siècle d'Atterrissages", article by Jacques Vallée, in the ufology magazine Lumières Dans la Nuit (FSR), France, #43. [jv1] "Passport to Magonia - On Ufos, Folklore, and Parallel Worlds", book by Jacques Vallée, Contemporary Books publisher, USA, pp 221-222, 1969. [jv2] Summary by Jacques Vallée in "En Quête des Humanoïdes", book by Charles Bowen, French translation of "The Humanoids", J'ai Lu publisher, France, pp 46-47, 1974. [---] "Les Extra-Terrestres", booklet by Jader U. Pereira, Phénomènes Spatiaux, GEPA, 1974. [gl1] "Face Aux Extraterrestres", book by Charles Garreau and Raymond Lavier, Delarge publisher, J'ai Lu, France, page 193, 1975. [---] "UFO Register", by J. Bernard Delaire, Data Research, Oxford, U-K., 1976. [lo1] "Encounters with UFO Occupants", book by Coral and Jim Lorenzen, Berkley Medallion publishers, USA, 1976. [am1] "Mystérieux Objets Célestes", book by Aimé Michel, Seghers publisher, France, page 211, 1976. [jr1] "New Data on 1954 European Wave And More Recent Foreign Cases", from Jean-Luc Rivera as source, submitted by Ted Bloecher, summarized by Mildred Biesele, translated by Alexander Mebane, in the ufology magazine MUFON UFO Journal, Mutual UFO Network (MUFON), USA, page 16, #130, September 1977. [---] "HUMCAT: Catalogue of Humanoid Reports", compiled by David F. Webb and Ted Bloecher, CUFOS, USA, circa 1978. [fr1] "OVNI, Premier Dossier Complet des Rencontres Rapprochées en France", book by Michel Figuet and Jean-Louis Ruchon, Alain Lefeuvre publisher, France, pp 136-137, 1979. [lg1] "The Fifth Horseman of the Apocalypse - UFOs: A History - 1954 October", monography by Loren E. Gross, USA, page 23, 1991. [---] "Faces of the Visitors", book by Kevin Randle and Russ Estes, Simon and Schuster publishers, USA, page 272, 1998. [dj1] "Encounters With Aliens On This Day", compiled by Donald A. Johnson, USA, circa 2005, at www.ufoinfo.com/onthisday/October09.html. 0.1 Patrick Gross March 26, 2003 First published. 0.2 Patrick Gross April 18, 2008 Conversion from HTML to XHTML Strict. 1.0 Patrick Gross December 23, 2008 First formal version. Additions [tb1], [lc1], [ud1], [ud2]. 1.3 Patrick Gross August 14, 2013 Addition [pr1]. 1.4 Patrick Gross September 24, 2014 Additions [cr1], [jr1], [ni1], [ta1]. 1.5 Patrick Gross December 13, 2016 Additions [jg1], [ub1]. 1.6 Patrick Gross December 20, 2016 Addition [lg1].